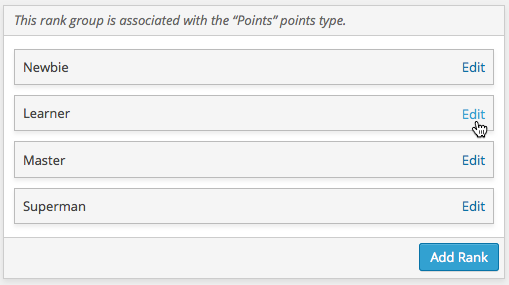 The ranks component was introduced in WordPoints 1.7.0. 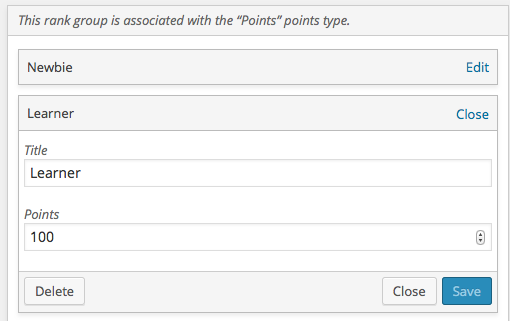 It adds the WordPoints » Ranks administration screen, where the ranks are managed. This tutorial explains how to add, edit, and delete ranks there. First, the ranks are organized into hierarchical groups, termed “rank groups”. 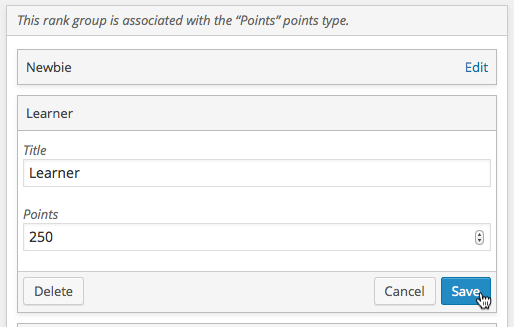 You may have multiple rank groups, each of which is administered separately, on a different tab of the Ranks screen. The first think you need to do is navigate to the tab for the rank group which you wish to administer. On each tab you’ll see a brief description of the rank group, a list of the ranks of the group, and an Add Rank button. Each of the ranks is displayed as a “title bar”, a block displaying the rank title and an Edit link. To edit one of the existing ranks, click the Edit link in its title bar. 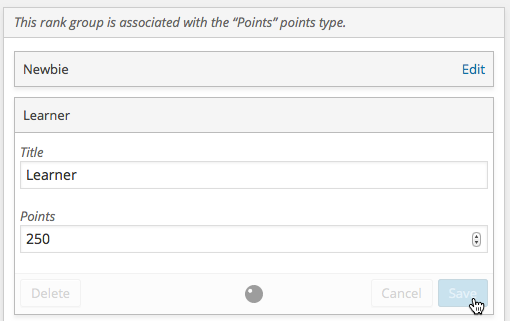 When the Edit link is clicked, the form for that rank’s settings will be displayed below the title bar. The Edit link is replaced with a Close link. If you don’t want to change any of the rank’s settings, you can click the Close link to close the rank form again. 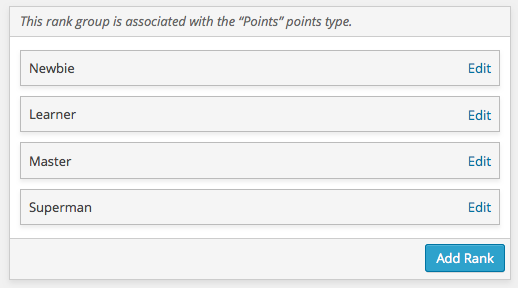 There is also a Close button below the form, which can be used to close the form, too. There is also a Save button, which is disabled, because we haven’t made any changes to save yet. 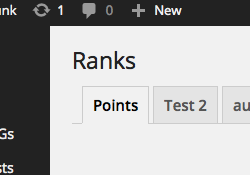 This rank has two settings: the Title, which all ranks have, and a Points field. The Points field is currently set to 100. Let’s change that to 250. 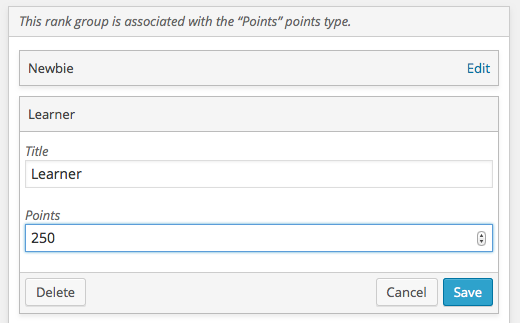 Now that we’ve changed the Points value to 250, the Save button will be enabled. The Close link has disappeared, and the Close button has been replaced with a Cancel button. If we decided we didn’t want to make this change, we could click the Cancel button, and the form would be reset. In this case, we want to save our changes, so we’ll click the Save button. It’s always a good idea to double-check your changes before doing this, because once you click the Save button, there is no turning back. Your changes will be saved and users’ ranks will be adjusted as needed. When the save button is clicked, a loading image will be displayed over the button bar while waiting for a response from the server. The length of time it takes to save the changes will vary based on your connection and server, and can also be affected by the number of users whose ranks need to be updated. Sooner or later though, the loading image should disappear and you should see a success message—or, an informative error message if there was a problem.